We know that changing our server IP addresses may result in many problems on your site. Some servers and scripts only allow (whitelists) our original IP address 50.116.9.254, so the requests sent from other IP addresses may not be accepted by your servers/scripts. So we keep sending HTTP requests from our original IP address for all existing cronjobs to prevent any problem. New cronjobs will receive HTTP requests from all available IP addresses by default. You can select which IP address(es) to connect to your server by clicking Edit cronjob, More options and select desired Server IP value(s). If you leave them blank and don't select any IP address, we'll use all available IPv4 addresses, and it is recommended to do so. You may also notice that we list our IPv6 address there. If your website supports IPv6, you may select it and we'll send the HTTP request via our IPv6 interface. If you website doesn't support IPv6 (doesn't have AAAA records), we'll show the error and ask you to remove our IPv6 address from the Server IP list. If you have any question or need any help, please feel free to contact us. SetCronJob officially accepts Bitcoin now! 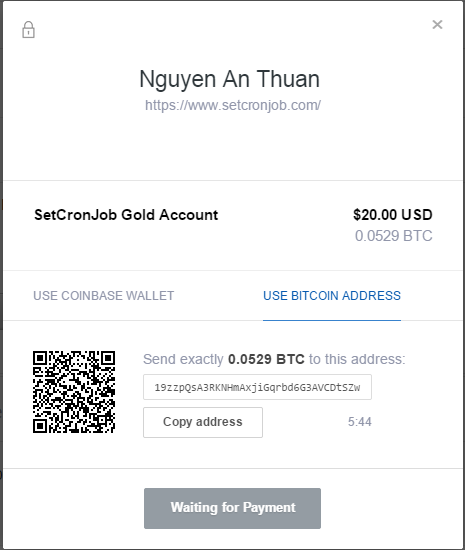 Since there are many requests, SetCronJob now officially support Bitcoin payment. We'll process the Bitcoin payment via Coinbase's service. You can make a payment using your Coinbase account, or just send the payment directly via Bitcoin network to the provided Bitcoin address. The payment will be processed automatically and your account will be upgraded/renewed then. 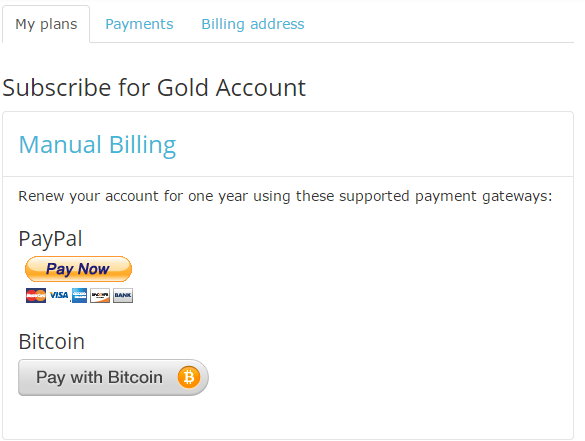 To upgrade/renew your account with Bitcoin, at the Subscribe just select Manual Billing option. It'll show the Bitcoin payment dialog where you can login to your Coinbase account, or get the Bitcoin address to send your payment. If you want to use the Bitcoin address, please note that the payment session will expire after 10 minutes. It should be enough for you to send the Bitcoin to our address. If the session expires, just reload the Subscribe page to get the new button. If you encounter any problem, please feel free to email me or comment below. This is an update to SetCronJob DNS cache. Since the day SetCronJob DNS cache was created, it is enabled by default and you can't make any change to it. This solves and generates some problems, so we should let you enable or disable it on your own. How to enable/disable SetCronJob DNS cache? To change it, click Edit cronjob, More options, you'll see the DNS cache option below the Name field. To enable it, check the box, and Save cronjob. To disable it, uncheck (clear) the box and Save cronjob. You can also select multiple cronjobs, then click With selected: Edit cronjobs, and select desired DNS cache option. You won't see any different after enable or disable the DNS cache. It get rids of name lookup, thus makes your script executed quicker. It also minimizes lookup errors e.g. in case your name server doesn't respond, we still have the cache. It ignores DNS records' TTL (not a good practice), so if your name server is down and your domain name is unreachable, your scheduled scripts in your web server are still running fine. Your website is under SSL (HTTPS), and SSL error occurs when we try to execute your cronjob. Maybe your SSL certificate is used for multiple domain name with the same IP address, while SetCronJob DNS cache will disable the SNI feature, thus it doesn't work. Your website is using IPv6 only. Our DNS cache doesn't work with IPv6, while our library works fine. Disabling the DNS cache will let our library choose which IP version to connect, and it seems it prefer IPv6 though. See updated info below. Your website IP addresses are updated frequently. From now on, if you want us to send HTTP requests to your IPv6 address, please click Edit cronjob, More options, then select our IPv6 in the Server IP list. If you have any question, please feel free to email me. Update on Aug 22, 2014: Adding two more keywords: __account__ and __cronjob__. This feature is now supported in both URL and POST data (click Edit cronjob > More options > select HTTP Method: POST or PUT). If you have any question or need any help, feel free to contact me or leave a comment below. You may recently hear about Heartbleed, an OpenSSL bug that allows attackers stealing protected information. 2 years ago, SetCronJob went 100% SSL to make sure your data is safe and secured. Like many other teams, we took action immediately to fix the vulnerability. Now SetCronJob is no longer vulnerable. You can test it here. We also regenerate our SSL certificate as recommended by security experts. However, you're strongly recommended to change your password at SetCronJob and many services that you've logged in recently. BTW, your password is not stored on SetCronJob server. We use the best one-way encrypted function to encode your password, so even when our database is exposed, attackers can't get your plain password.